To start viewing active condos for sale at 55 E. Erie, click on the features MLS listings below, or give us a call today at (312) 953-0961 to schedule a private showing for a unit you'd like to see in person! 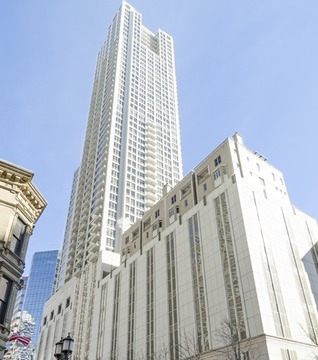 Interested in condos for sale at 55 E. Erie? Call or text us today at (312) 953-0961 to schedule a private tour of the building and any of its available condo residences on the market! River North is one of the hottest neighborhoods to call home in downtown Chicago, which means most luxury condo buildings offer top-notch amenities to fit the needs and wants of potential residents. Just some of the in-building amenities at 55 E. Erie include a fitness center, full length Olympic size lap pool, a Jacuzzi, sauna and steam rooms, on–site dry cleaners, bike storage, a party room with a full kitchen, an outdoor sun deck, and 24-hour door staff. On-site garage parking is also available at 55 E. Erie. Given 55 E. Erie’s luxurious reputation, many units have been customized to the design tastes of many of its previous and current owners. But don’t worry, you likely won’t find a condos for sale at 55 E. Erie that doesn’t have all the highest-quality upgrades you can find, not to mention some amazing views of downtown Chicago. Most 55 E. Erie condos for sale boasts hardwood floors, lavish marble baths, cozy fireplaces, private balconies, and gourmet kitchens that include granite counter tops, custom back splashes, and stainless steel appliances. The large floor to ceiling windows inside each 55 E. Erie condo allow residents to enjoy the amazing cityscape that surrounds the building, while as mentioned above, most condos here come equipped with a private balcony that also enhance the living experience here. If you're in the market for a luxury condo in Chicago, please contact us. 55 East Erie has it all! Not seeing anything you like at 55 E. Erie in River North? Start browsing more River North condos for sale, or contact us today at (312) 953-0961 for help with your Chicago home or condo search!